I’m usually not a big fan of mint in baking. Except when there’s chocolate involved too. Actually, pretty much anything will pass muster if there’s chocolate involved. Except maybe potato chips dipped in chocolate. Have you ever tried those? N.a.s.t.y. But I’m getting off topic. These little mint chocolate blossom cookies, on the other hand, are a tasty morsels of chocolate and mint deliciousness. Since I have kiddos that are obsessed with sprinkles, these are decorated with a healthy coating of sprinkles, but sprinkles are optional. With an electric mixer, beat margarine and sugar until smooth. Blend in egg yolk, milk, and peppermint extract. In a separate bowl, stir together flour, cocoa, and salt. Add the flour mixture to the butter mixture and mix until combined. Roll the chilled dough into balls, approximately 1” in diameter. Roll each ball in sprinkles and place on a cookie sheet. 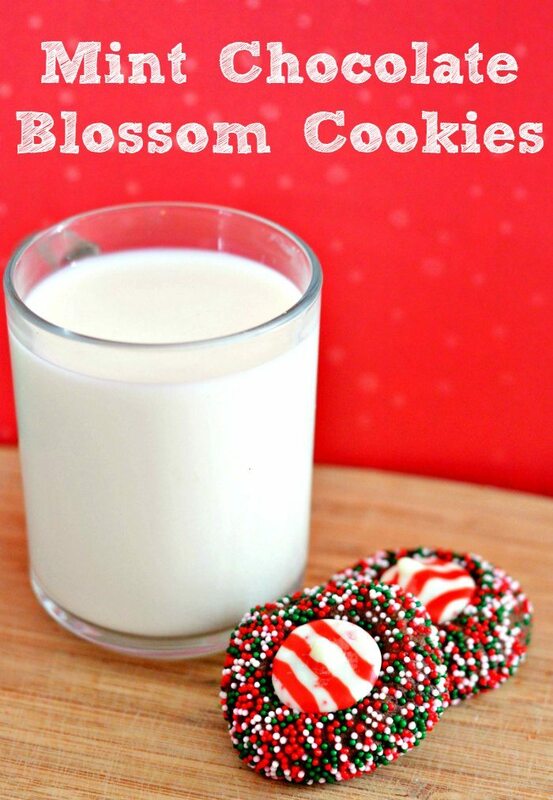 Press any loose sprinkles in with your fingers.Use your thumb to make an indention in the top of each cookie. Chill the prepared balls another 30 minutes. This keeps the cookies from running. Bake at 350 degrees for 10-12 minutes, or until set. Remove the cookies from the oven and immediately press a Hershey Kiss into the center. Allow to cool for 5 minutes, then transfer to a cooling rack.